SKOV has introduced a range of direct driven variable speed BlueFan, offering more precise control of ventilation and improved energy efficiency. 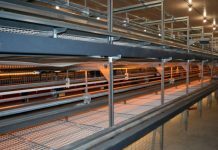 These fans exceed the capabilities of conventional belt-driven fixed-speed fans that are the mainstay of the U.S. egg industry. 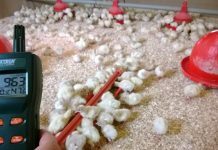 SKOV is a multinational company based in Denmark with over 60,000 poultry houses in operation, spanning 65 nations on five continents. The advantages of a variable speed fan are based on physical laws determining performance. The ability of a fan to move air, measured in cubic feet per minute, increases proportionally with fan speed when using the same diameter blade. Sometimes producers change the diameter of drive pulleys to increase airflow, but unfortunately this approach bears a heavy cost. Power consumption increases exponentially with fan speed. At a blade speed of 400 rpm, power consumption for a typical 48” fan may be 500 watts. At 500 rpm, representing a 25 percent increase in speed and air displacement, the power requirement will double to 1,000 watts which will be reflected in the cost of operation over a specific period. The opposite is also relevant in that slowing the fan speed to reduce airflow results in disproportionately lower power consumption. It can be shown that at full capacity, a variable speed fan operating at 550 rpm uses 1,400 watts of power. If fan speed is reduced by 20 percent to 450 rpm, power is reduced to 780 watts. A 38 percent reduction in fan speed, representing a practical limit, to 340 rpm effects a further reduction in power use to 350 watts, 65 percent lower than at maximum capacity. Previous articleUSDA Weekly Egg Price and Inventory Report, November 28th 2018.